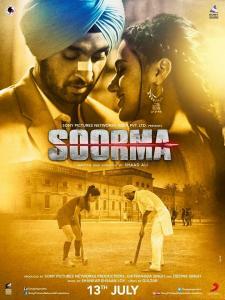 SOORMA is the unbelievable story of Sandeep Singh, his beginnings in the world of hockey, his accident and his comeback that shocked everyone. Sandeep Singh (Diljit Dosanjh) is from the village of Shahabad, Punjab. As a kid, he is enrolled for hockey training under Coach Kartar Singh (Danish Husain). But Kartar’s strict ways forces him to leave the training in his childhood itself. When he turns adult, he gets interested in hockey again when he falls for Harpreet (Taapsee Pannu). She is an efficient hockey player and Sandeep decides to try his luck on the sport once again to woo her. Meanwhile, Sandeep’s brother Bikramjeet Singh (Angad Bedi) never left hockey and has the potential to play in the national team. However he doesn’t get selected. He returns home dejected but is overjoyed when he realises that Sandeep can do the dragflick, an extremely difficult skill of hockey, effortlessly. Bikramjeet hence takes Sandeep to Patiala so that Coach Harry (Vijay Raaz) can train him. In no time, Sandeep gets selected in the national team. He also is given a job in an airline company. Harpreet is ready to marry him too. However, all his dreams are shattered on August 22, 2006, when he’s traveling in a train and a police officer accidentally fires him on the back. Sandeep survives but he gets paralysed from his waist below. Needless to say, he can’t play hockey again. What happens next forms the rest of the film.